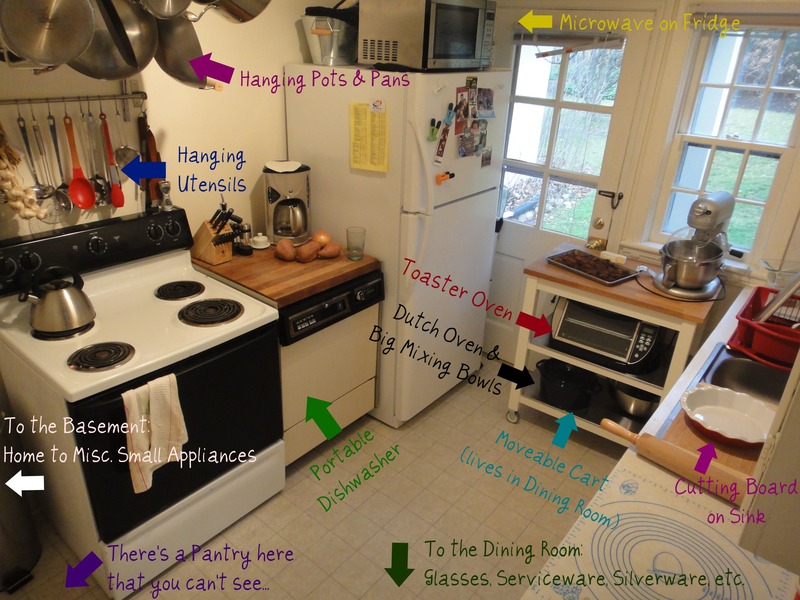 I thought you might enjoy seeing what kind of kitchen I work in on a daily basis because it may make you feel better about your space (or teach you some tricks for maximizing the space you have). I by no means think my kitchen has reached maximum efficiency, but its working! We learned the very important lesson that you must be continually cleaning up while cooking or you’ll run out of room – our sinks are really small, so there’s not much room for stacking dirty dishes. We’ve also learned the art of maximizing the height. We have 9 foot ceilings, so we were able to hang our pots and pans which helps out tremendously as we have very minimal cabinet space. We also gave up on trying to put all our dishes in the kitchen, so all the glasses and service-ware live in a hutch in our dining room (we have my parent’s first dining room set…okay, so our apartment is furnished mostly with furniture they bought when they got married 30 years ago. Its vintage at this point!). When I really need to be doing a lot of cooking and baking (like for Thanksgiving when I made a Maple Bourbon Pecan Pie, Cranberry-Orange Bread, Oyster Dressing, Sage Sweet Potatoes, Pumpkin Bread Pudding, Coconut Macaroons, Chocolate Chip Meringue Cookies, and a Pie Crust Cinnamon Roll in a 36 hour period), I drag my kitchen cart into the kitchen and cover half the sink with a bamboo cutting board to expand my counter space. Another reason for the cart is the fact that my jumbo Kitchen Aid mixer, which I am in love with, can’t fit on my counters because the cupboards hang too low. We also have come to terms with the fact that a lot of our small appliances just aren’t going to fit in the kitchen and/or dining room, so those live in the cupboards in the basement. Some examples include our ice cream maker, deep fryer, fondue pot, and mixer attachments. We also moved our 150-bottle wine rack to the basement because the temperature down there doesn’t swing as wildly as it does on the main floor (we get as low as 55º F in the winter and as high as 85º F in the summer – our duplex is 70 years old and not the most energy efficient place I’ve ever lived). Our humble kitchen is proof that you can do great things in a tiny place, you just need to take the right approach! The picture below is taken from the doorway from the dining room looking into the kitchen. Seriously, you’re looking at the entire kitchen. Swear. This brings back memories. We’ve cooked in way smaller. I remember having to use the kitchen table for prep and then manage to get the meal off the table and back on all while entertaining. This would have seem spacious! One kitchen we had was huge but had no counters. You’ve done a great job here, trust me. I’ve also had the huge with kitchen with little counters (or cupboards for that matter). I’ve actually had a kitchen in college smaller than this one which was AWFUL!